Mibazaar has created this Google Map to show the Indian Members of Parliament who have pending criminal cases. 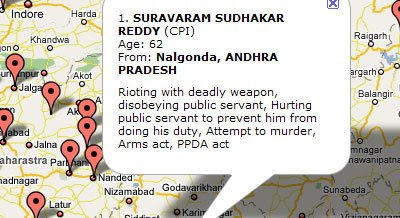 The names of the MP's concerned are listed in the the map sidebar. It is possible to click on the names in the sidebar or on the map markers to open an information window that details the current charges against the MP. Ushahidi, the crowdsourcing crisis information platform, have teamed with SwiftRiver and eMoksha to produce this citizen-driven election monitoring platform for the 2009 Indian general elections. India is the world’s largest democracy but in past elections there have often been controversies over the illegal use of government resources for campaigning, incidences of divisive and inflammatory rhetoric in campaign speeches, and allegations of violence, intimidation and other irregularities. Vote Report India have partnered with citizens’ networks, human rights organizations, and journalists to contribute direct SMS, email and web reports on violations. It is aggregating these direct reports with news reports, blog posts, photos, videos and tweets related to the elections from all relevant sources, in one place, on a Google Map. The Lok Sabha is the directly elected lower house of the Parliament of India. This year there will be a general election for the next five year term of the parliament and Google have teamed up with The Hindustan Times to produce a dedicated page for Indian voters. The 2009 Lok Sabha Elections uses Google Maps to help Indian voters find and view data about their constituency. If you enter your address into the search box the map will centre on your location and show the constituency boundary. The page will then display 'Development Data' for the constituency, which includes a host of demographic information. You will also be shown the current members of parliament for the constituency.